It was that time again to head up north to Sheffield to compete in the 2nd leg of the North Midway. Despite it being half term and Valentine’s Day we were still able to field two teams…..thank you to all those played! ….and to Chris Kilby for looking after our 2nd team!…again! Play started with Leicestershire 1 playing Derbyshire and Leicestershire 2 playing Yorkshire 2…… Our first team had a great start with a 10-0 win. Leicestershire 2, however, had a tough first match against what turned out to be quite a strong second team for Yorkshire. There were some close matches though with most of them going into double figures. Final score 8-2 to Yorkshire 2. The next round of matches was Leicestershire 1 versus Cheshire with Leicestershire 2 having a break as one team had dropped out of their group….time for a team talk ready for the next match!! Leicestershire 1 looked to be starting well with one win in the mixed only narrowly losing the second 20-21. Cheshire proved to be too strong this time in the singles for us winning all four. Time for the level doubles, we needed to win all four to get a draw and be in with a chance of a win on points! We started well with two convincing wins in the boys doubles, followed by a win in the first girls doubles….unfortunately after a tough battle Cheshire took the second girls doubles 21-16! Final score 6-4 win to Cheshire. Round 3 was Leicestershire 1 versus Yorkshire 1 and Leicestershire 2 versus Warwickshire. Our first team started well with a comfortable first boys singles win, our first girl had a close match but lost out 15-21. 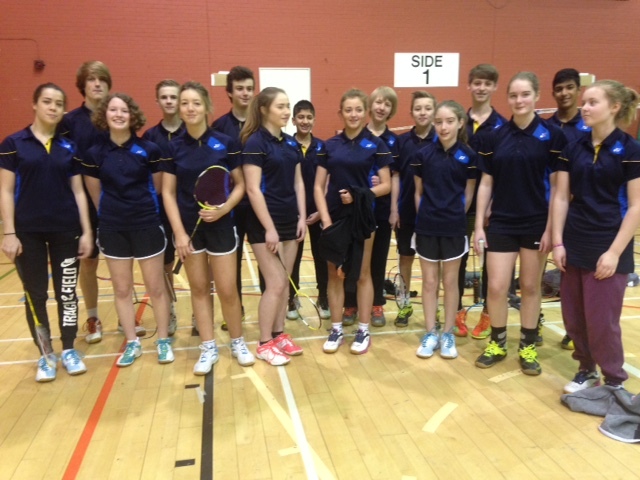 Both second boy and girl had exciting close matches losing 18-21 and 20-21….so nearly!! Boys doubles both went Yorkshires way, one match only just, 20-21. Girls doubles were close matches, one going to each team. Yorkshire proved to be too strong again in the mixed winning both games. Final score 8-2 win to Yorkshire 1. Our second team were up against Warwickshire next. Started out by very nearly taking a win in one of the mixed, losing 20-21! Boys singles next with one great win in the second boys singles! The Warwickshire girls proved to be too strong and won both of those games. Both boys doubles pairings battled hard in their games with two very close scores 20-21 and 17-21, both games going to Warwickshire! The girls fought hard to win their doubles but were outplayed by their opponents. Final score 9-1 win to Warwickshire. After the first round games both teams found themselves in 3rd position in their groups placing them in the bottom group with Derbyshire for the next round of games! The round started with Leicestershire 2 taking on Derbyshire and Leicestershire 1 having a break! Our second team made a good start winning one mixed doubles and only narrowly losing the other 20-21. The boys both had convincing wins in their singles but unfortunately the girls lost out, one was 20-21! The match now stood at 3 all with just the doubles to go! The boys doubles could have gone either way , both hard fought games, 19-21 and 21-20, a game to each county! It was all down to the girls doubles whether they could secure a win…..Leicestershire 1, Derbyshire 1….final score 5 rubbers each, 190 points each…. the match was then decided on wins out of 5 for no.1 BS, GS, BD, GD and XD…. Derbyshire won 3-2! Last match of the day…..our teams had to play each other!! Well done to all the players who played over the two tournaments….altogether 19 Leicestershire players!